Marine and boating art can be commissioned in oils or acrylics on canvas, in any size. All that is needed are good photos of the subject vessel, a description or photos of the background, as well as the size of the painting required. In some cases, the artist may have to do archival research or build a model of the subject so that markings and specific features can be accurately depicted. Although most orders can usually be filled within 30 working days of receipt of order, some commissions may take longer depending on research required. 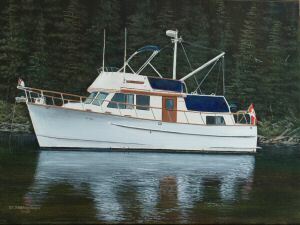 Example of a recently completed portrait of a Monk 36 converted trawler. Click To view my Marine paintings.